This article is about the scooter. For the mission associated with it, see Pizza Boy (mission). The player on a Pizza Boy in GTA Vice City. 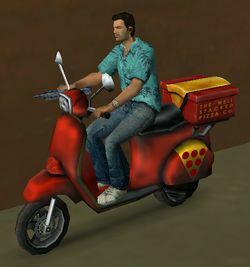 The Pizza Boy is a delivery scooter in Grand Theft Auto: Vice City, Grand Theft Auto: San Andreas and Grand Theft Auto: Liberty City Stories. For GTA San Andreas and GTA Liberty City Stories, the name of the vehicle is referred by the game as a single word, "Pizzaboy". 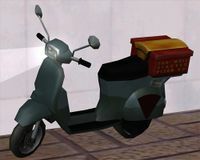 The Pizza Boy is a delivery scooter based on the Faggio, and, as its name suggests, is intended for pizza delivery, mainly with Well Stacked Pizza in GTA Vice City and GTA San Andreas, and Joe's Pizza in Staunton Island in GTA Liberty City Stories. The Pizza Boy is distinct from the Faggio for various reasons. The bike features unique liveries; in GTA Vice City and GTA San Andreas, the vehicle bears a red and yellow paintwork in relation to Well Stacked Pizza; in GTA Liberty City Stories, it is painted green and white livery in relation to Joe's Pizza. In addition, the scooter is equipped with a top box for cargo. The GTA Liberty City Stories rendition is given a slight facelift to appear slightly more modernized (complete with a flat rear light cluster). A "Pizza Boy" in GTA Vice City. A "Pizzaboy" in GTA San Andreas (With delivery boy). A "Pizzaboy" in GTA Liberty City Stories. Aside its outward appearance, the Pizza Boy's performance is otherwise identical to the Faggio, expect it is capable of seating only one rider as the top box has taken up the rear seating. The Pizza Boy is adopted for use in side missions, specifically, "Pizza Boy" missions, where the player delivers pizzas to customers scattered around the pizza parlor. The mission is not available in GTA San Andreas, but courier missions with roughly the same concept as "Pizza Boy" exist. The Pizza Boy's default radio station in GTA San Andreas is K-Jah West. Pizza Boys are not commonly seen on the streets, either only appearing parked in specific locations in GTA Vice City and GTA Liberty City Stories, or rarely being seen driven by Well Stacked Pizza delivery boys in GTA San Andreas; the Pizzaboy is not found parked anywhere in GTA San Andreas. Outside any Well Stacked Pizza shop, Vice City. Spawns in the mission Road Kill, as Carl Pearson's vehicle. The green Pizzaboy from "Ice Cold Killa" in GTA San Andreas. Rarely seen being driven by Well Stacked Pizza delivery boys all over San Andreas. A unique green Pizzaboy is attainable during "Ice Cold Killa". The player must destroy Jizzy B. 's Broadway before entering the Pleasure Dome, forcing Jizzy to flee on a stolen Pizzaboy. The player will only need to kill Jizzy without destroying the bike to obtain it. Outside Joe's Pizza in Bedford Point, Staunton Island. This page was last modified on 21 November 2012, at 00:26.